The Return of Otter Clan 2004. Otter Clan returns with a bigger camp and new challenges. Otter Clan does Burning Man 2003. Introducing Otter Oasis activities and interviews with the Otters. 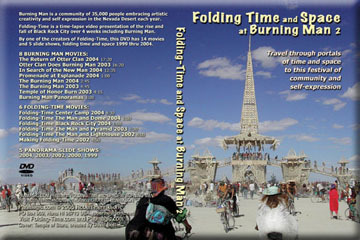 6 Folding-Time Movies: Center Camp CloseUp 04  Man and Dome 04  Black Rock City 04, Man and Pyramid 03  Man and Lighthouse 02  Making Folding-Time 02.